Its Monday morning and I'd like to start this week off with an amazing breakfast recipe. 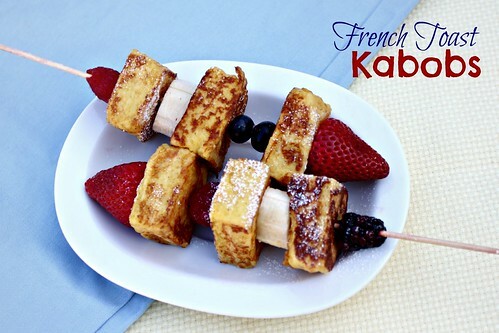 I recently saw a recipe for french toast kabobs on the Martha Stewart website. The recipe looked great but it called for so many ingredients that I didn't have and didn't want to go out of my way to get (one of them being a thick sliced loaf of bread). So I put a twist on her recipe and it tasted amazing. What's unique about this french toast is that I created a thick slice by making a cream cheese sandwich with two slices of bread. That alone, my dear friends, is enough to make my stomach happy. The exact steps to this deliciousness follow below. Step 1: Beat eggs with milk, salt, and vanilla extract. Cinnamon and sugar are optional but I recommend you put them in because french toast always tastes better sweet. Step 2: Spread 2 slices of bread with cream cheese, sprinkle sugar on both sides, and make a sandwich out of them. Cut off the crusts and cut the sandwich into one inch cubes. Step 3: Melt one tablespoon of butter on a pan. Dip the cubed bread in the egg batter and place the bread mixture in the pan; cook it while turning the cubes occasionally with a spatula, until it's browned on all sides. Cook the remaining cubes with the remaining butter. Dust the cooked cubes with powdered sugar. 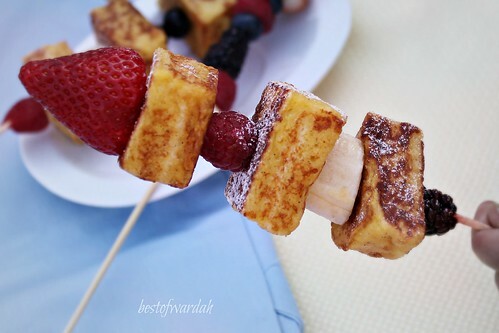 Step 4: Thread the french toast cubes on to skewers alternating with the fruit. Top the skewer with a strawberry and serve immediately with whipped cream or maple syrup. Wow, looks delicious! I've been craving french toast, I can't wait to try this! Oh my goodness!! This looks so yummy! I'm obsessed with French Toast! Such a fun way to serve. Would be super adorable for a brunch party.